Following the announcement Theresa May asked MPs in Westminster to back the deal or risk “more division and uncertainty”. Speaking at a news conference she called on them to “move forward together into a brighter future”. Prior to leaving for the summit the Prime Minister penned a “letter to the nation” pleading for the public to back her deal amid growing opposition in Parliament. EU leaders marked the moment with a tinge of sadness. Ahead of the summit however, European Commission president Mr Juncker warned Britain cannot expect to get a better Brexit deal if Parliament rejects the agreement hammered out by Theresa May. He told reporters: “This is the deal. It’s the best deal possible and the EU will not change its fundamental position when it comes to these issues,” he said. “I think this is the best we can all do – both Theresa May and her Government as well as the European Union. 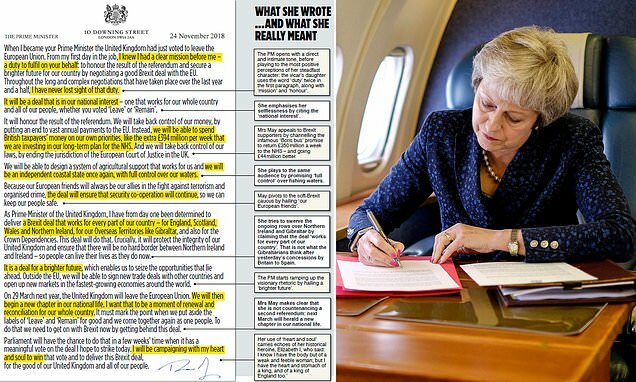 The almost 800-word message is an attempt to speak directly to the public to build support for her deal, which faces widespread opposition. Westminster including from both wings of her Conservative Party and the Democratic Unionist Party which props up her administration. The Commons vote is the major hurdle Mrs May must now overcome if her hard-won deal is to be enshrined in UK law.